A group of U.S. Marine Corps drill instructors has been under investigation for hazing and abuse allegations for incidents dating back more than six months, during which time a recruit assigned to the group's battalion died at boot camp in Parris Island, South Carolina. 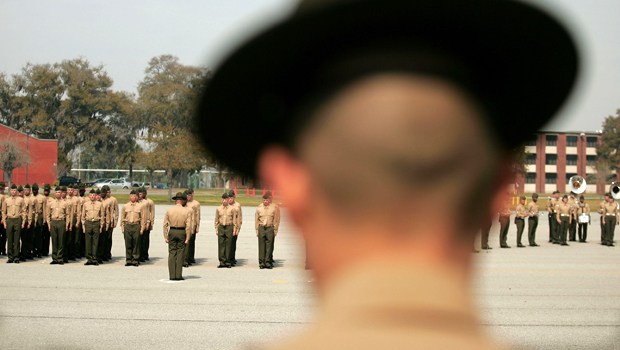 Fifteen instructors and their leaders are under investigation, the Marine Corps Times reported on Wednesday. A statement from the corps' Training and Education Command unit to the Times said investigations dating back to November center on a training battalion where recruit Raheel Siddiqui was assigned at the time of his death earlier this year. Siddiqui, 20, fell to his death in a barracks stairwell on March 18, just days after his arrival to the Marine Corps Recruit Depot in Parris Island, the Times reported. An investigation into Siddiqui's death found that a drill instructor was "improperly placed in charge of recruits" while being the subject of an ongoing investigation, according to the Marine Corps statement. On Wednesday, The Wall Street Journal, citing multiple unnamed Marine officials, reported that the instructor supervising Siddiqui, a Muslim, allegedly put another Muslim recruit into a clothes dryer and made "racially charged remarks." According to the Times, at least two Parris Island leaders have been fired in connection to the investigations into Siddiqui's death. The Marines under investigation have been reassigned to duties where they don't directly interact with recruits, according to the Times.